An old tunnel opened in 1920 linked ‘Kendal, Milne & Faulkner’ buildings (aka Kendals, now House of Fraser Manchester) on opposite sides of Deansgate. The rebuilding of the current listed building on the west side of Deansgate was completed in 1940 and the site was actually the extension to the original store on the east side (itself rebuilt after the street widening in 1873, and now Waterstones). The tunnel is fondly remembered by many workers and visitors to the department store. Talking to some present staff there are tales of five or six other tunnels heading in different directions from the store. A newspaper feature on the centenary of Kendals reported that the subway had opened in 1920, although the earliest referral to it in ads was 14 January 1921, when it was announced that the furnishing store in the main building could be accessed by ‘the new subway under Deansgate’. The tunnel under Deansgate is roughly in the vicinity of the Men’s shoe area in the basement (indeed photos in Below Manchester show it being used for shoe storage), and was blocked off in 1981 when the eastern site was sold. Another short tunnel built in 1939 as a subway underneath Southgate could take shoppers to shelter from air raids. I believe the same subway (one level up from the sub-basement) takes shoppers into the rear area of the menswear department known as ‘The Annexe’, underneath the adjacent car park. The basement and sub basement of the present building were reinforced during construction due to the outbreak of war with space provided specifically for use as shelters for customers. You can see photos on Flickr by TVurbex of the Southgate subway including a shot similar to the one in Below Manchester. The Manchester Evening News have a recent story about the tunnel with a 2009 photo from Keith Warrender. Work began on the subway in 1921 and it opened on July 4 in the same year after being mentioned in a Kendals’ summer sale advert. It was damaged when a huge fire ripped through Kendals in 1939 and water used to extinguish the blaze flooded the tunnel. The subway did reopen and was used by thousands of shoppers. At one time there was a stall selling flowers and plant shop deep in the tunnel. It closed for good in 1981 when Kendals sold one of its buildings to Waterstones. It is no longer possible to walk from one side to the other, but the subway does still exist. The former entrance is roughly in the men’s shoe department in the basement of House of Fraser. A correspondent writes: I remember this was still being used in the late 70’s. It was wide and lined with recessed display windows. If I recall correctly, it was ramped down from the lift lobbies on the North side with a few stairs to connect with the South side building. . Another writes I used to work at Kendal’s on Deansgate when their Food Hall was on the other side of Deansgate separate from the main store then. We accessed the Food Hall that was underground, via a tunnel that went from the main store side under the road to the smaller part of the store on the other side of Deansgate. I used to work in an office that was partly underground too. They sold the smaller store so assume this was blocked off. Ladies’ and children’s shoe departments were added and sites became linked by an underground passage – still accessible, behind the scenes, from today’s menswear department, said to be the largest in the country. 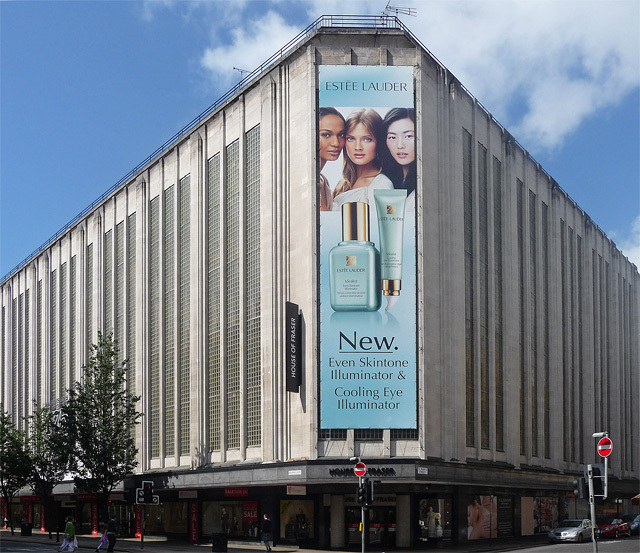 The House of Fraser store occupies this monumental block of Portland limestone punctuated with vertical greenish glass windows. 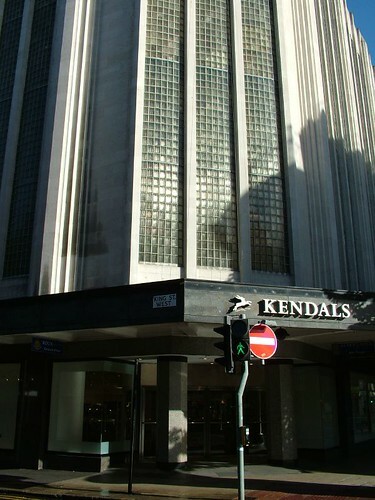 It was built in 1939, by J. S.Beaumont, as an extension to the Kendal Milnes store built in 1873 across Deansgate. When the new building was added to the store it, was connected below Deansgate by a tunnel.